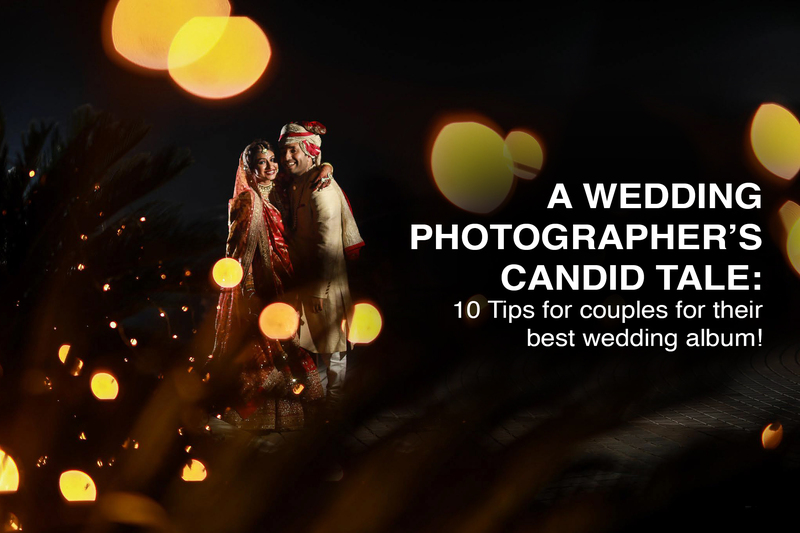 A Wedding Photographer’s Candid Tale: 10 Tips for couples for their best wedding album! After 2555 days, 174 weddings and what seemed like at least 1,92,350 shots, I feel obliged to share a secret with you all. Weddings photographers are more than just your camera-clicking-editing-geniuses. There is a lot of creativity, planning and definitely patience that goes into the making of memorable wedding albums and as the couple in question, it is as much in your hands as much your photographer to make it a dream wedding come true for both the parties. I have seen the best of wedding photographers from our circle have a miserable time because of small details overlooked by the couple. Sometimes, it’s not just about putting great things together but also find sync amidst them. Not much of a notes-making kinds, but here are my 10 most learned tips for all couples to be for their perfect wedding albums! Have you done your homework well? Just like hunting for your dream lehenga or finalising ‘the’ honeymoon venue, your wedding album too, is a task that needs a considerate amount of homework. So don’t be lazy just asking friends or checking facebook pages, and chart out a work plan. To start with, consider only the specialised photographers to create your first list. Check out their portfolio and assess which one makes the closest cut to the style of shoot you’ve in your mind for your wedding. Compare packages, and I’d recommend you meet them personally before finalising the photographer. It is crucial that you and your photographer have the same understanding of the vision and same goal, to make you happy with the album. Taking up a small shoot (save the date, engagement, etc.) with the team to test out your chemistry with the team is also a great idea. Focus on even the simple details, like confirming your main photographer (incase you’re hiring a firm) makes a lot of difference on your final day of action. Make it count! Portraits with extended family and the childhood friends are as important a part of your wedding album as the main event. Sit with your photographer and workout a schedule which involves enough buffer periods (ideally 45 minutes each) between you getting ready and the main ceremony so you can plan for these behind the scenes shoot as well. At the same time, giving a list of what’s important to your photographer in advance, from your grandmom’s jewellery that you are repurposing for your wedding to your favourite cousin who’s come all the way from Canada for the wedding, ensures you miss out on nothing without fretting about it much at the last minute. While the usual routine demands two different photography teams be hired for bride and groom, it only adds to the chaos on the D-day to have two set of everything for photography taking over most of the space, competing for their share of best pictures. It’s always a great idea to have a discussion with your spouse and parents beforehand, and instead invest in one incredible team that will give you equally incredible results – with half the struggles, lesser space issues and definitely lesser money spent. I don’t see anyone complaining on that one! This one applies all the more so for destination weddings. While budget is a real constraint, but putting up your main photographer at a distant hotel than where the bride and groom are staying is never a good idea. Perfect moments don’t happen on a notice, so it’s important your photographer is there to capture the main event as well as those candid shots of you while getting ready or sharing an intimate moment with your family just before the ceremony. Not having to carry their whole equipment set from one hotel to the other, it gives the photographers one less thing to worry about and gives them time on hand to get creative with telling your story in the best possible way. This one is something all us photographers have struggled with, as we control the strained smile on our faces and request the friends and families so we don’t have to compete with their cellphones for the best space and shot. A lot of my great shots have hit the dump just because someone or the other interferes in the shot composition, trying to take their own share of images of the ceremony. A quick memo on the save-the-date to not click images at the main stage/mandap could work beautifully as a subtle reminder for the friends to enjoy the wedding and leave the jobs to the professionals. All that hard work of yours at putting together the whole ensemble and matching colour theme with decor can go to waste if it doesn’t translate well on those photographs at the end of the day. Apart from being comfortable in your skin, hiring a make-up & hair expert seals the deal in that department. You cannot predict the weather conditions, the delays in between and that friend of yours who otherwise does amazing smokey eyes may not be well equipped to deal with all of this. The products, the techniques professionals use last with you through all and still makes you look good. Giving you another reason to smile through your pictures! While it’s certainly your wedding pictures at the end of the day, pick your battles (of concern) wisely so you and your photographers have lesser things on your plate to worry about. Case in example, you do not need the raw images of ALL THE SHOTS taken by the photographer. There is a reason why the photography team curates the entire data before handpicking the best of the shots that meet the requirement for the brief you gave your photographer for your perfect wedding album. Unless you’re a professional, there isn’t much you’re going to make use of the raw files either. Insisting to get the entire data only takes away valuable time from your hands scrolling through thousands of similar looking pictures of shots, apart from making your photographer frumpy. Similarly, in case of budget restrictions, go for a package that gives you better quality, well-conceptualised pictures over an album of random images. More than the exotic decor theme or the perfect red shade of your lehenga, the right lighting makes all the difference in your photographs. So if you’re in middle of budget prioritizing at the moment, focusing on the lighting conditions and set up as per the venue chosen by you should be topping your list. Another bang-for-your-bucks area is the backdrop details. These unmistakably make it to almost all your images, so one right decision on these could make up for a tight budget beautifully. While planning to the last detail would definitely save you from some uncalled scenarios, there is only as much as you can do in advance. Do your best, but once you’re done, just step back and learn to relax. You’re the boss here after all, it’s your own wedding! Embrace what works out as well as what doesn’t and let yourself enjoy. So if you’re not much of a poser, stick to what keeps you comfortable and happy. Having a good time reflects in your body language, and by default, your photos. Well, this one sounds like an obvious one, but is quite a bummer if missed upon. Between long hours of covering the ceremony, thinking of all creative shots, ensuring all your favourite aunties and oldest friends got a nice click with you, the photographer can have a long day at work. Timely snacks and meals ensure they are well fuelled for this grind, and happily so. Ideally, have your photography team eat the same time as you, that way they’re ready just when you are for your next photo-op. Previous Meet the Canon 6D Mark II- Your most versatile friend so far!